After nine long years, BMW has announced an update to their BMW R 1200 GS. New features include E-gas (throttle-by-wire), optional electronic cruise control and multiple riding modes (Rain, Road, Dynamic, Enduro and Enduro Pro). Also new are an LED headlight with an optional daytime running light and a new vehicle power system. The new tubular steel bridge frame with rear subframe offers increased torsional stiffness while the revised chassis geometry and a longer swingarm provide better traction. New tire sizes are 120/70-R19 (front) and 170/60-R17 (rear). Displacement remains unchanged at 1,170cc, but the big news is the introduction of liquid cooling! Unlike the previous engine which was air/oil-cooled, the new engine is air/liquid-cooled. Liquid in the parts exposed to the most severe thermal stress, and air cooling for the rest. Two small radiators have been added. BMW reports output of 125 horsepower at 7,700 rpm and 92 lb-ft of torque at 6,500 rpm. Both are significant increases over the previous model. The engine housing incorporates the 6-speed transmission with a wet slipper clutch (instead of the previous dry clutch). The single-sided swingarm has changed and is now on the left side of the motorcycle. 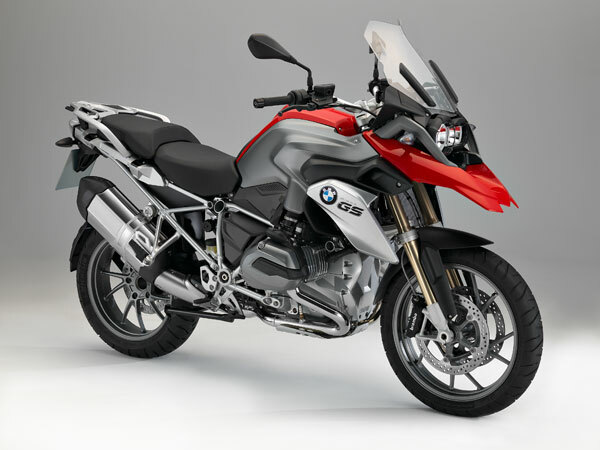 The new BMW R 1200 GS will be available in Alpine White, Thunder Grey Metallic, Racing Red and Blue Fire. Pricing and availability were not announced. Lots of details (and more pics) over at BMWBlog.com.